The first thing I had to do was select a cheese from their cheese list. It took me seconds to spot “Fontiago.” Was it a typo? I had heard of Fontina and Asiago, but what was "Fontiago?" After cooking and eating nearly three pounds of it, I can tell you it’s not a typo. It’s for real. And it’s fantabulous. Fontina is mild and nutty and prized for its melting ability. Asiago, although similar in taste to Parmesan, is more assertive. 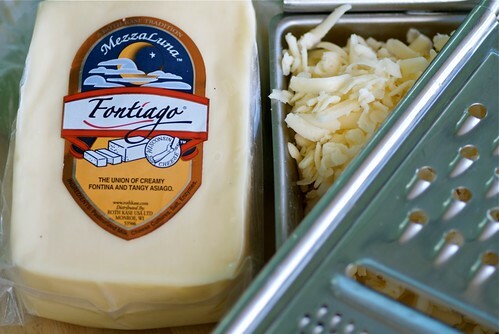 Fontiago is a unique cheese that marries Fontina with Asiago in one creamy, tangy, aromatic cheese. To honor the cheese’s Italian roots, I decided to make an Italian macaroni & cheese with pancetta, basil and parsley. As the macaroni & cheese cooks in the oven, the aroma is deliciously reminiscent of wood-fired pizza, thanks to the smoky pancetta and nutty Fontiago. With a generous coating of grated Parmesan and toasty olive oil-soaked breadcrumbs, this Italian macaroni & cheese is tantalizingly crusty on the outside. The crust, however, gives way to a luscious, soft cheese filling flecked with salty, diced pancetta and fragrant fresh basil and parsley. A couple of dashes of crushed red pepper flakes provide just the heat it needs. I have made this Italian macaroni & cheese several times now and can tell you that it’s easy enough for a mid-week dinner yet sophisticated enough to serve for company, especially when paired with a side salad and red wine. Since I found Wisconsin Fontiago, living the good life got a whole lot easier. Of course, the red wine doesn’t hurt. 1. Preheat oven to 350°F. Coat a 9x13-inch baking dish with butter or cooking spray. 2. In a small skillet over medium-high heat, add pancetta. Cook 3 to 4 minutes, or until browned and crisp. Set aside. 3. In a small bowl, combine breadcrumbs and olive oil, mixing with your fingertips. Set aside. 4. Cook pasta in salted water, about 2 minutes short of being fully cooked; it will finish cooking in the oven. Drain the cooked pasta, but do not rinse. Place in a large bowl. 5. Meanwhile, melt butter in a small saucepan over medium-high heat. Whisk in flour. Gradually add milk, whisking continuously until it reaches a boil. Reduce heat and simmer for 3 minutes, or until thick and bubbly. 6. Add cooked pancetta, Fontiago cheese, cream sauce, crushed red pepper flakes, salt, black pepper, basil and parsley. Stir well. Pour into prepared baking dish. Sprinkle with grated Parmesan and breadcrumbs. Bake for 30 to 35 minutes or until the top is golden brown and the cheese sauce is bubbling around the edges. *Fontiago Cheese is a Wisconsin original made by Roth Käse cheese company, www.rothkase.com. 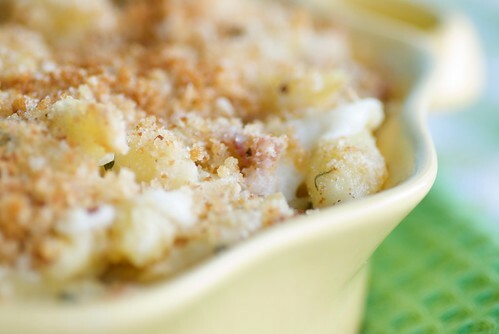 For more delicious macaroni and cheese recipes, check out http://www.30days30waysmacandcheese.com/. I just had my wisdom teeth out and you are making me so hungry! Pancetta mac-n-cheese? You're a genius. And I sincerely respect your ability to eat 3 + pounds of cheese. BRAVO! I have never put basil in my mac n cheese. Love this recipe! A touch of sage in mac n cheese works well too! This my first time hearing of this hybrid cheese - I want. So appetizing! What gorgeous flavors. A great macaroni cheese! That cheese sounds amazing and your mac & cheese looks like the best I've seen! I just found your blog and was excited that you live so close. I haven't heard of that cheese, but now I'm really going to have to find some so I can make your recipe! Sounds like my kind of mac & cheese! I've been reading your blog for a while already but I've never actually left a comment. I really don't know why! I truly like your blog with all the yummy recipes and wonderful photographs. Your blog introduced me to the world of food blogs which I love now. Thank you for helping me find me true passion. Red wine, Fontiago and macaroni and cheese you certainly have discovered the good life Susan!!! rachel-Ooh, I had my wisdom teeth removed years ago. Hello to a week of milkshakes. Get better soon! PS-I had help with the cheese. If I didn't, I would have cracked the seat of my office chair! maria-Then I hope you try it. karen-Wow! That is so kind of you. dandy-Aw, thanks! Where do you live? patsyk-It's definitely my kind of mac and cheese! monica-It was my first time tasting it, but it won't be my last. sari-Well, I sincerely appreciate that lovely comment. It's comments like yours that help keep me motivated. All the best to you. Oooeee, I'm SO excited to try this! Fontina is one of my favorite cheeses ever and combined with the allure of Asiago? Perfect! 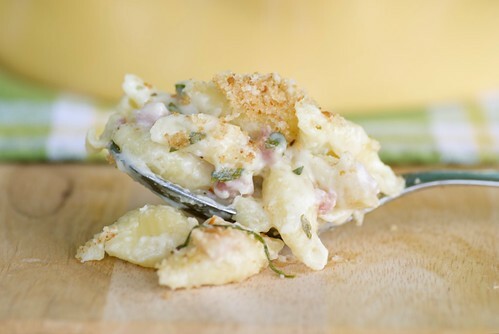 pancetta mac n cheese, oh I'm so making this for tonight--I dont know about the hybrid cheese though! Some would say pure is better but some times a cross is just the perfect blending. Love the sound of this cheese ... and always I'm up for Macaroni & Cheese. I've never made Mac and Cheese....this year, I'll correct that!!!!! Thanks. Mmm....sounds so good! I have a bunch of pancetta in the freezer, now all I need to do is find some of that cheese, and I'm all set! This sounds just right for a wintry Saturday in Minnesota. I add Fontina cheese to baked polenta. I'm going to look for some Fontiago to add next time. Looks so creamy and delicious!! Mac and cheese with PANCETTA? WOW. This recipe really elevates the humble M+C to a gourmet level! Well done. Gorgeous. And wow you got to read over a cheese list? How did you select ;)? I made this tonight, and everyone from age 2 to 65 loved it! Thanks for another delicious recipe, Susan.